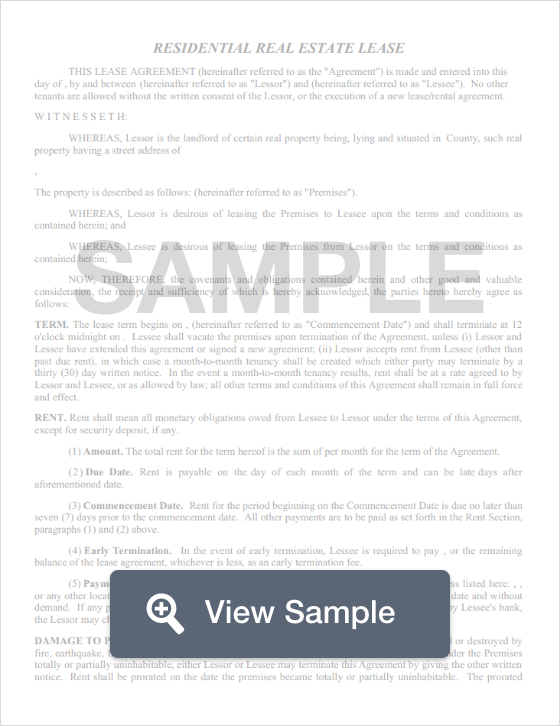 Create an Alabama Lease Agreement with our attorney-drafted template! What Is an Alabama Lease Agreement? An Alabama lease agreement is a written agreement between the landlord or property management company the person who wishes to lease the space. This person is referred to as the tenant. An Alabama lease agreement can be used for residential or commercial space. The most commonly used Alabama lease agreements are for commercial spaces, a lease with an option to buy (commonly referred to as a lease to own agreement), a month-to-month lease agreement, a roommate agreement, and a residential lease agreement (sometimes referred to as a standard lease agreement). Sublease agreements are sometimes used, but tenants must have written permission of the owner to sublet the property. Writing an Alabama lease agreement should include certain information based on the type of agreement being used by the parties. Below, you'll learn about the common elements involved in most Alabama lease agreements. How the premises may be used (for example, it's a residential dwelling or it's a commercial space). How long the Alabama lease will last. Month to month Alabama leases must adhere to specific Alabama laws. Whether the lease can be renewed. The amount of the rent and other expenses the tenant will be responsible to pay. For example, is it all bills paid or are there certain bills, such as water, that the tenant must pay? Whether the tenant is allowed to make improvements to the premises. What happens if the tenant pays their rent late. Any other terms or conditions for the lease, such as whether pets are allowed and, if so, if there is a size or breed restriction. Contact information for both the landlord and the tenant for legal notices. The names and ages of anyone who will occupy the premises if it is a residential lease. A signature and date from both parties. Both the landlord and the tenant should keep copies of the executed Alabama lease. Which Disclosures Belong in an Alabama Lease Agreement? Under Alabama state law, the landlord or property management company must give two days' notice before entering the property for a non-emergency. This is often referred to as "Access by Landlord." Under Alabama state law, the landlord or property management company must be identified in the lease. This includes identifying any individual or business that has the legal authority to act on behalf of the landlord. Under federal law, the landlord or property management company may be required to give a disclosure of the possibility of lead paint. To learn more, visit the HUD website to learn about the Lead Disclosure Rule. Alabama state law places a maximum limit on the amount that can be charged for deposits under lease agreements. The landlord or property management company cannot ask for a security deposit that exceeds the amount of one month of rent. However, they may ask for other deposits such as one for pets, extra liabilities created by the tenant, or changes to the premises on behalf of the tenant. Create a free Alabama Lease Agreement in minutes with our professional document builder.